Hotel Star Loulé is located within a walking distance of several facilities offered in Loulé. It is situated 15 minutes from Vilamoura, Quarteira and Faro International Airport.Standard bedrooms, all equipped with free Wi-Fi access, air conditioning,.. This lovely Hotel is set in Vilamoura. Nestled within 2. 9 kilometre(s) from the town centre, the accommodation allows easy access to all this destination has to offer. Visitors can find the nearest golf course within 400 metres from the Hotel. The establishment.. This apartment is a beautiful, luxurious and tastefully furnished, spacious self-catering apartment, with shared swimming pool. The apartment is fully equipped for a self-catering holiday and can easily sleep 5 to 6 guests. With a double bed in the master..
Hotel Star Loulé is located within a walking distance of several facilities offered in Loulé. The unit offers 26 cosy and comfortable bedrooms, with single, twin and double bedrooms, traditionally decorated. 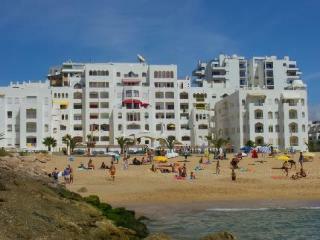 All bedrooms are equipped with free Wi-Fi access,..
Apartments situated 350 m from Praia da Rocha beach. The Clube Dos Arcos is situated in the cosmopolitan area of Praia Rocha, only 350 metres from the beach and 1 km of the resort centre with a wide range of shops, bars and restaurants. The apartments..